"Today Is Going To Be Epic"
Chicago, USA: Nigerian food and good feeling! Nigerian food- in CHICAGO! 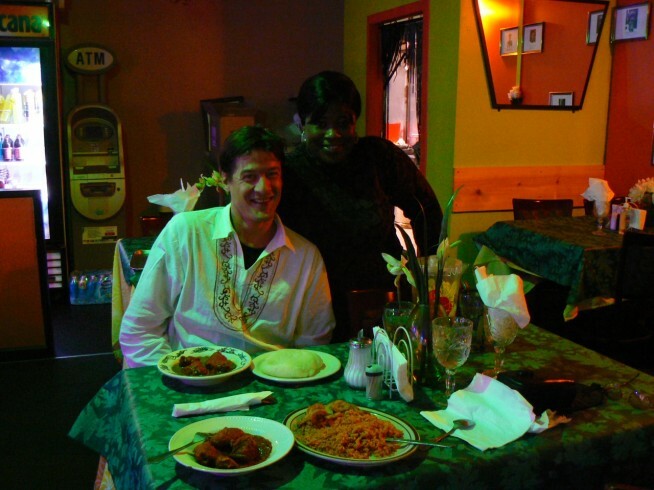 This is a modest, unpretentious and authentic Nigerian place in Chicago.The owner was very kind and welcoming and even told us some of her secrets in cooking! I love this place and want to go back again whenever I can visit Chicago. Things ordered, goat curry ( wonderfully spicy) fish, meat and (something else) stew ( spicy! ), Jollof rice ( wonderful spices!!) with some FUFU. The place felt like it was in Nigeria. Other patrons were speaking in their native languages and the only English I heard spoken was when the owner/server came to us. Truly a wonderful experience. 1: Gay men traveling world wide, from place to place, bonding with other gay men. We, gay men, are often characterized in many different ways by different segments of the global society. Our Vagaybond travel journeys show you the extraordinary lives of our gay community, their supportive family and friends. We gaily travel the four corners of the world making friends with other gay men, mutually sharing our lives, blogging about, their culture, food, drink, and experiences that celebrate life. What does it mean to travel as a Vagaybond? Trips are small and intimate up to 10 guys. The 12 of us will travel to extraordinary destinations and experience the land as the locals. Meeting local "Family" GLBT, and discovering the landscape with each other is what makes the journey memorible. The food, drink, and experiences that truly make for a memorable trip. Check out the "Travel With Us" link to see the who what and where for the upcoming year. Remember, we do travel like Vagaybonds - so our focus is to bond with each other and our destination. We keep the cost and the frills at a minimum so that fluff does not hinder us from true enjoyment - and yet we know how to be pampered. So enjoy the "Gay Profiles" on the vagaybond site - and we hope to have you join us on one of our trips.